Inspired by Mo we decided to try a similar format for Miles’s trip journaling, to wit, one sketch and one juicy sentence each day describing a sight or experience. We gave it a try over our spring break trip to France and were happy with the results. It was nice for him to have a structure, and even when we missed a day going back and playing catch up was manageable, something I find overwhelming about full blown record-absolutely-everything journaling. Now, almost two months in, I can say journaling is, if not an everyday, at least an every other day habit for Miles and he will have a fabulous memento of his journey to look back on some day. 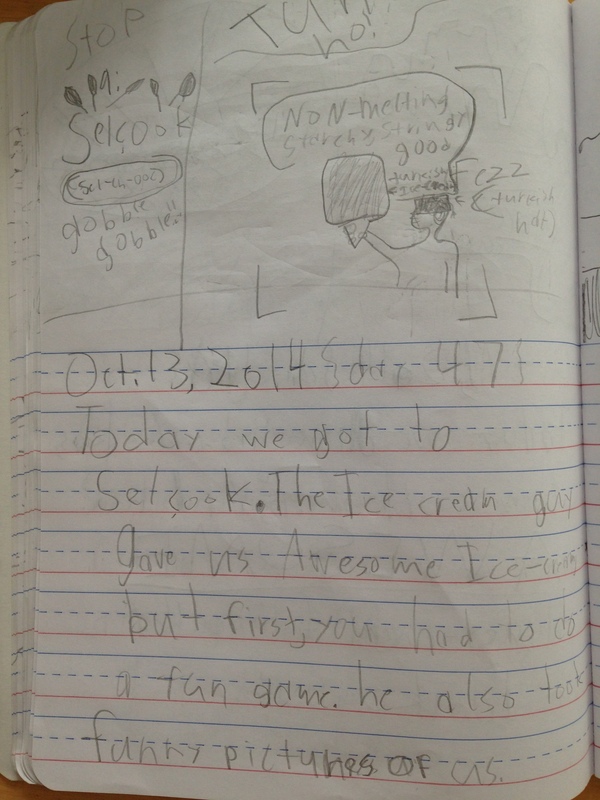 Here’s a sampling from his journal so far. 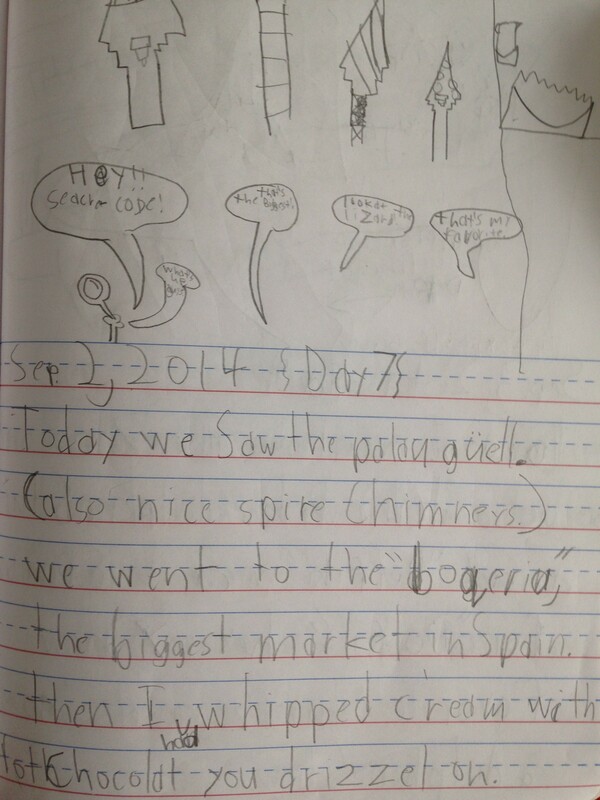 Not surprising for a kid of mine, many of his entries mention food. Aug. 29- Today we saw the Picasso Museum and found inappropriate paintings (only 10? ), then a very short thunderstorm poured on us on our walk home. Sept. 2- Today we saw the Palau Guell (also nice spire chimneys.) We went to the Boqueria, the biggest market in Spain. Then I had whipped cream with hot chocolate you drizzled on. Sept. 8- Today we saw the Colloseum which is BIG. We also had pizza for lunch and dinner and saw 100 Smart cars in 6 hours. Sept. 10th- Today me and dad went to the Explora Museum and worked valves and machines, built dams and talked about the weight and density of different objects. Sept. 20th- Today we got to Venice, which looks like a fish. Also there are UPS boats, police boats, and every type of car as a boat. Sept. 28th- Today we went to the part cool, part boring Archeological Museum. Some things are from 5800 BC! Oct. 2nd- Today we went into town which was a big labyrinth, had awesome baklava and saw CUTE kitties. Oct. 13th- Today we got to Selçuk. The ice cream guy gave us Awesome ice creams but first, you had to do a fun game. He also took funny pictures of us. Miles – I can’t wait to hear your stories. Your journal is certainly evidence of the fun you are having! I also love the Lego man pictures.